Due to their large size and composition, industrial and automotive batteries are potentially much more dangerous than portable batteries, so they must be collected separately and following strict safety protocols that guarantee their correct final management in a treatment plant. Ecopilas has created two specific industrial collection channels, adapted to the needs of producers and the most frequent technologies in this type of products, also ensuring complete traceability of the collection and management of these batteries. Ni.Cd batteries are commonly used in large industrial installations, in the electrical, railway and oil and gas sectors. They are very demanded in intensive uses for their reliability and at the same time they require a high level of safety, but they need a high degree of control, due to their potential environmental danger. In Ecopilas we have created a work group together with the main companies in the sector, to monitor these batteries and ensure their proper collection and final management. Industrial use, those used in industrial equipment such as UPS or to propel forklifts. 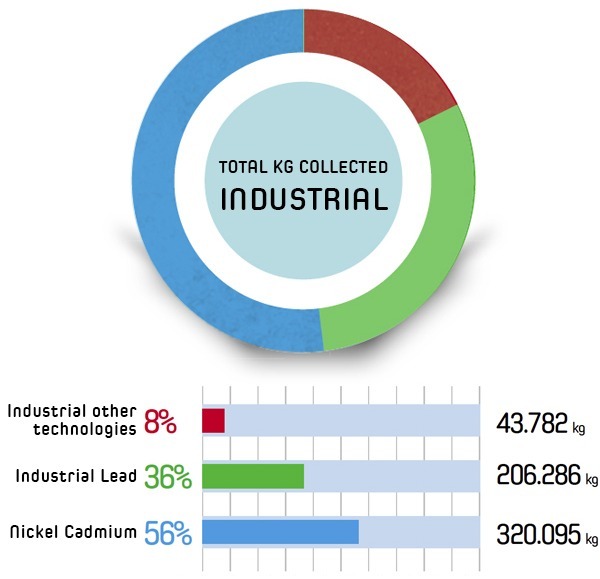 This collection channel currently represents 15% of all industrial collections made by Ecopilas thanks to agreements reached by Ecopilas with the main recyclers of lead-acid batteries in Spain, to ensure proper treatment of this type of waste. Automotive use (those used for starting and lighting of vehicles). The automotive batteries are collected mainly in the vehicle repair shops that Ecopilas producers have in their distribution centres. ELECTRIC VEHICLE BATTERIES USED FOR “VEHICLE PROPULSION” ARE INCLUDED IN THE “INDUSTRIAL USE” BATTERY CATEGORY. Ecopilas launched in 2013 the operation for the collection and final management of batteries of electric vehicles, which was very well received by manufacturers of these vehicles, as they are the basis for a sustainable future for this type of waste. Ecopilas currently has more than twenty major manufacturers and importers of electric vehicles, who trust our experience in the management of used batteries, to set in motion the collection operations needed by these large companies. AUTOMOTIVE BATTERIES, ACCORDING TO THE DEFINITION OF RD 106/2008 ARE ONLY THOSE THAT ARE INTENDED FOR STARTING, LIGHTING OR IGNITION OF VEHICLES, WHATEVER THEIR TECHNOLOGY. Electric motorcycles and bicycles also incorporate industrial batteries for electric mobility, two markets that are currently expanding. ECOPILAS is already giving an answer to these sectors, both producers and collection points to properly manage the waste of these batteries which are usually based on Li-ion technologies, informing of good practices for safe storage. LEAD IS A HEAVY METAL WITH HIGH TOXICITY, BUT ITS USE IS STILL WIDESPREAD BECAUSE IT HAS NOT BEEN POSSIBLE TO FIND A TECHNOLOGY THAT CAN REPLACE IT BY EQUALISING OR IMPROVING ITS PROPERTIES OF RELIABILITY AND EFFICIENCY IN BATTERIES AT AN ECONOMIC PRICE. LITTLE BY LITTLE, THE TECHNOLOGY THAT COULD REPLACE IT WILL BE THE LI-ION BATTERIES THAT ARE CURRENTLY BEING USED IN THE VAST MAJORITY OF ELECTRONIC EQUIPMENT. DESIGN OF COLLECTION OPERATIONS: COLLECTION AND RECYCLING SERVICE FREE OF CHARGE TO CUSTOMERS AND DISTRIBUTORS. BATTERIES AND GENERATED BATTERIES MUST COME FROM PRODUCERS REGISTERED IN THE REGISTER OF BATTERIES AND ACCUMULATORS OF THE MINISTRY OF INDUSTRY (RII-PYA). MEET THE MINIMUM WASTE ADEQUACY REQUIREMENTS FOR SAFE TRANSPORT.